Toss cooked chicken with your favourite flavour of barbecue sauce and you're halfway to our BBQ Chicken Salad. 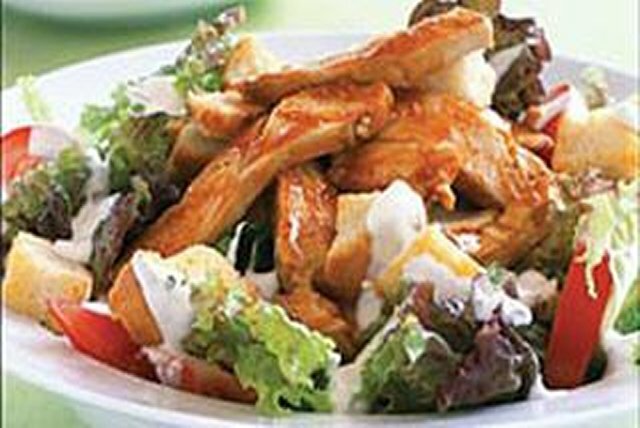 Combine the chicken with crisp greens, tomatoes, croutons and ranch dressing and you are on your way to a delicious main dish salad. Mix chicken and barbecue sauce in large frying pan; cook on medium-high heat until heated through, stirring occasionally. Toss remaining ingredients in large serving bowl. Serve topped with warm chicken mixture. Substitute 2 cups chopped leftover roasted or grilled chicken for the deli cooked chicken. Excellent source Vitamin A, good source Vitamin C & Iron, moderate Dietary Fibre.